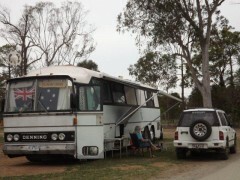 "Tumbi Umbi" is owned by Phil and Sue from Full time on the Road . 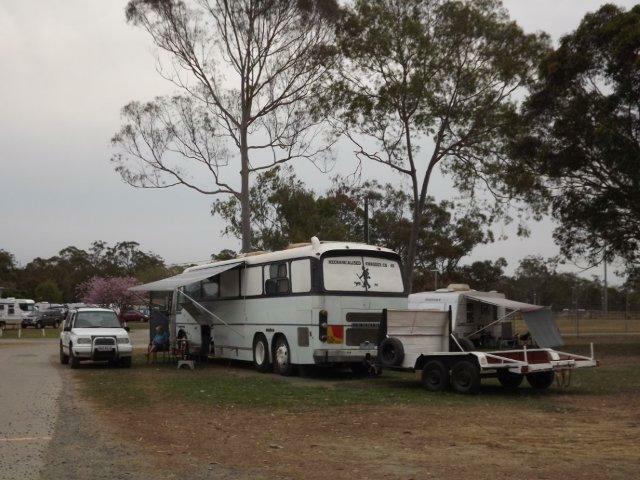 Tumbi the motorhome is a !981 Denning Denair tag axel Powered by 871 detroit has a six speed spicer gear box we just put a new complete clutch in and happy with it not think we ever had a clutch .We have owned her for five years and lived in it that long it was a motorhome when we got it. But have changed it many times opening windows was one of the many things we changed as it never had any that open . we have a Suzuki vitara witch sits nice and snug on the car trailer witch will soon house our sat dish as well .